I have a letter from a reader asking where to buy Video Essentials. I bought our NTSC version from online … I remember receiving something about there being a PAL version, but perhaps it came from Kanes in the US. 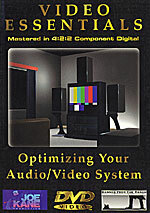 Unfortunately Joe Kane Productions stopped production of Video Essentials in 2001. While it was being carried by EzyDVD for a while here in Australia, it seems that they have long since sold out. JKP are working on a new version (called Digital Video Essentials) which they claim will be available in PAL, but their web siteseems to have been last updated last year some time. 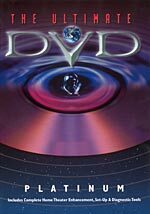 Alternatives are the Ultimate DVD Platinum, but this is ‘Out of Stock’ at EzyDVD (and like Video Essentials is in NTSC, so the settings made using the disc often don’t carry through to PAL playback). Alternatively, and perhaps more usefully, a number of ‘THX’ logoed PAL DVDs have a system setup section. This is normally accessible through the ‘Setup’ menu. Titles include Star Wars: Episode 1, The Phantom Menance; Star Wars: Episode 2, Attack of the Clones and Pearl Harbour. Unfortunately these titles don’t have the colour filter that assists in nailing down this aspect of performance properly. From time to time I Google for a PAL setup DVD, but the only ones that seem like they may possibly meet my requirements seem to be professional-level German ones … and I can’t read German. UPDATE (Thursday, 31 July 2003, 1:16 pm): The THX glasses can be purchased here. This entry was posted in DVD, Testing. Bookmark the permalink.